I think this is my favourite roast dinner. 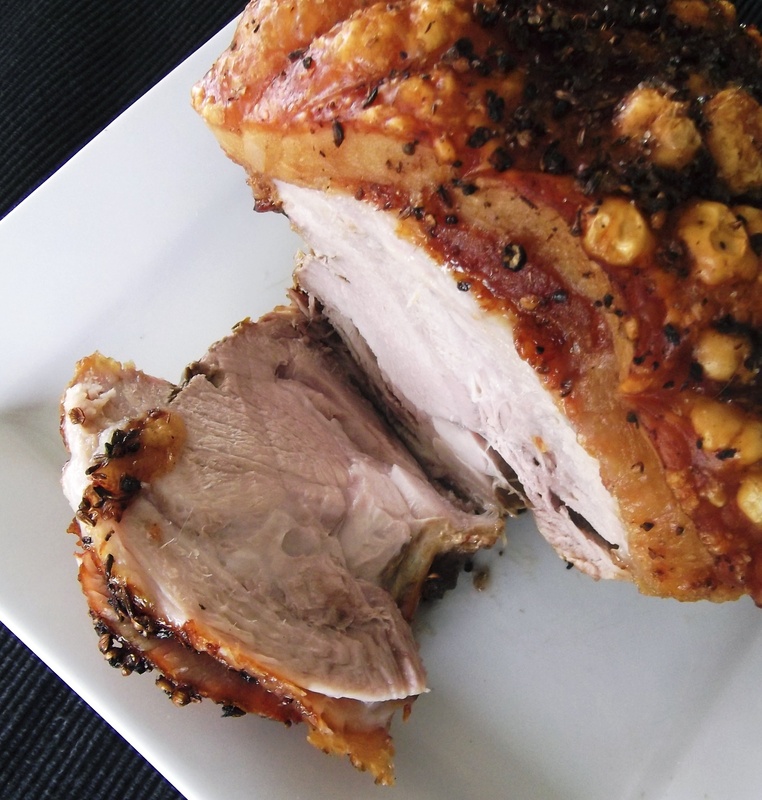 I love this pork because it is so easy to cook and tastes absolutely amazing. It also fills the house with a great smell as it roasts. I have made it a few times now, for both family and friends, and comments received include “the best roast pork ever”. Not an exaggeration in my opinion. The crackling is so crunchy and full of flavour from the fennel rub, and the meat is tender and juicy. The key to the crackling is heat and salt, so don’t skimp on either of those. I have tried this recipe with both boned pork leg and also shoulder, but I think that shoulder works much better. That is great because it is one of the cheaper cuts. You could serve this pork with apple sauce or your favourite gravy, but it really doesn’t need any accompaniment. Apart from some roast potatoes of course! I have adapted this recipe from one I found on taste.com.au. Heat your oven to 240C/220C fan forced/460F. Put the pork on a clean work surface. Remove any netting that came wrapped around the pork. If the rind has not already been scored, get a sharp knife and score it at even intervals (without cutting all the way through). How far apart the scores should be depends on your preference for serving the crackling – if you like nice neat pieces then score the rind at even intervals, but if you like rustic crackling then it doesn’t matter so much. Using kitchen string, tie the roast at 2cm/1 inch intervals. This will help it to hold its shape and retain moisture during cooking. 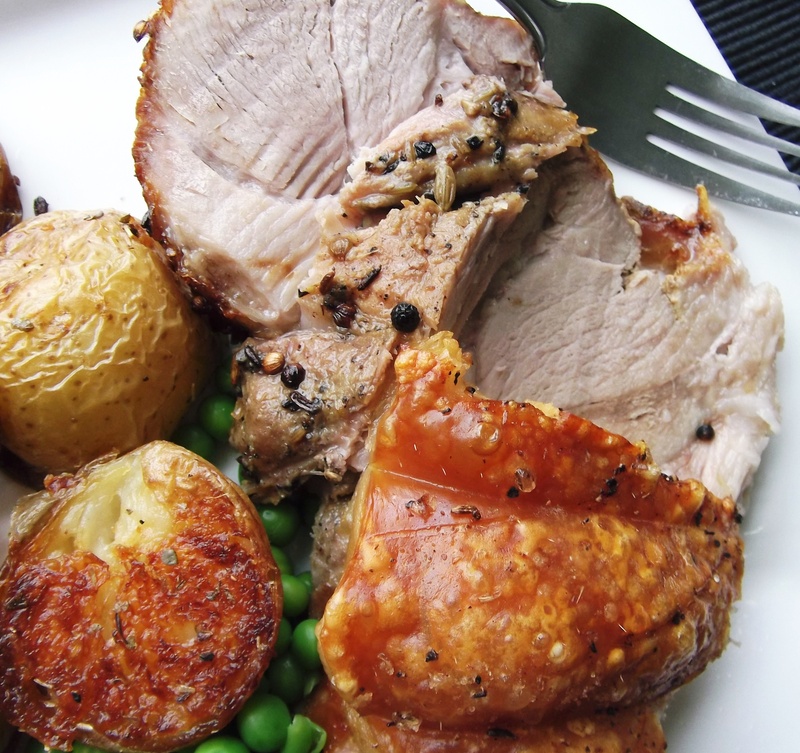 Put the pork on a roasting rack in a roasting pan, ensuring that the rind is facing upwards. Boil the kettle and then pour about a cup of boiling water over the top of the pork. This will open up the scores that you have made in the rind. Carefully discard the water from the roasting pan and then pat the pork dry using kitchen paper. The pork is now ready for the rub. To make the rub, put the fennel seeds, coriander seeds, chilli flakes, peppercorns, sea salt and garlic granules into a pestle & mortar, (or a spice grinder if you have one), and grind until the seeds have just broken down. Put the mixture into a small bowl. Add the juice and finely grated zest of the lemon as well as the olive oil and mix to form a coarse paste. Rub this paste all over the pork, but mainly on the rind. Put the pork in the oven and cook for 30 minutes. The rind should begin to blister. Turn the oven down to 160C/140C fan forced/320F and cook for 2 hours and 30 minutes, rotating the pan at regular intervals. 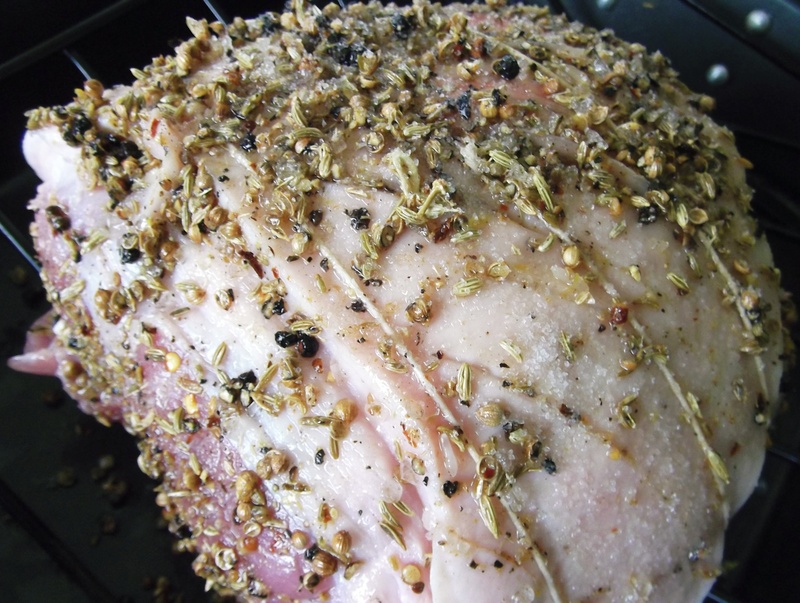 Don’t baste the pork – I have found that this will affect the quality of the crackling. Once the above cooking time is complete, have a look at the rind and assess the crackling. If it is not blistered all over, then turn the oven back up to 240C and give it another blast for 10 minutes or so at the higher temperature. Remove the pork from the oven and put it on a plate. Cover loosely with foil and rest for about 30 minutes. When ready to serve, lift the crackling off the pork and put it on a separate plate. Remove any excess fat from the bottom of the crackling then break into pieces ready to serve. Also check the pork for any excess fat, although you will find that most of it has disappeared during cooking. Slice the pork into nice chunky slices. 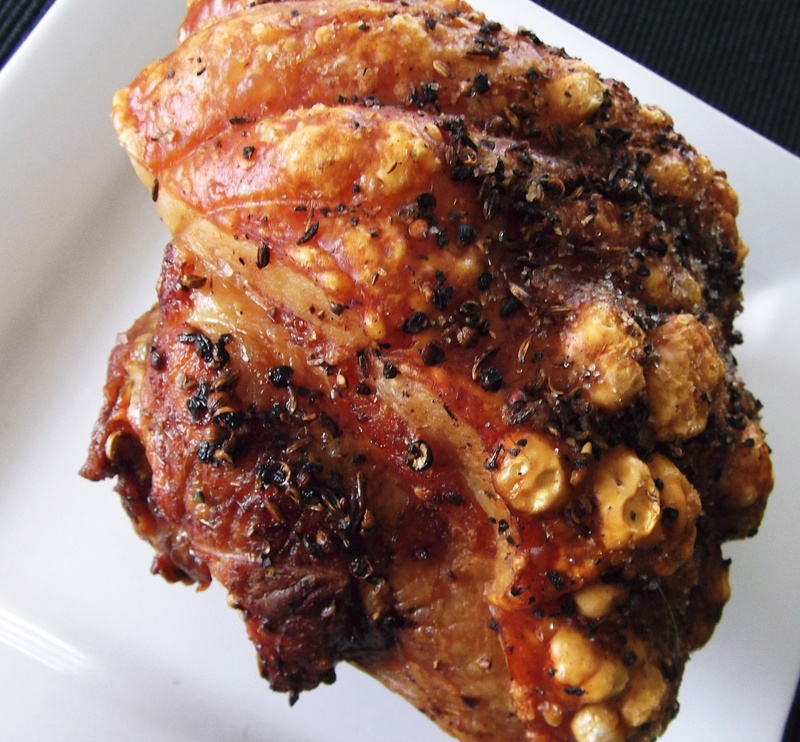 Serve the pork and crackling with your choice of roasted vegetables. 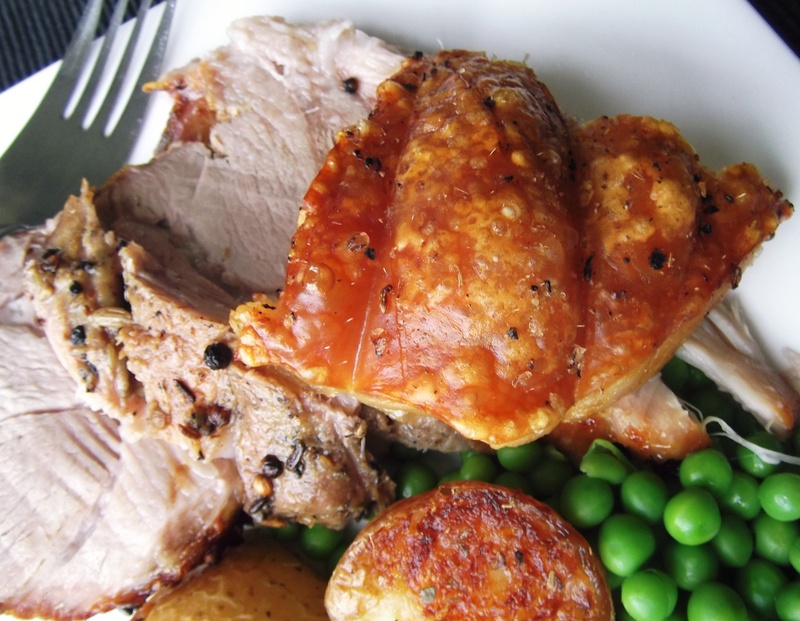 This entry was posted in Mains and tagged Celebration, Food, Pork, Recipe, Recipes, Roast, Sunday lunch. Bookmark the permalink. Sounds so wonderful – pork is definitely up there are one of my favourite meats, probably above most cuts of beef. I went for a walk today and brought home so many wild fennel leaves – can’t wait to use them. Fennel is something I never used until recently, but now I use loads of it! Looks lovely! I have pinned it in my things to try. This looks lush. Crackling is absolutely magical the way it turns delicious and crunchy! My favourite joint of pork is the belly, cooked slowly in half a bottle of white wine with coriander and fennel seeds and lashings of sea salt rubbed into the skin.